The NMTF works hard in the interests of our members. We lobby government through the increasingly influential All Party Parliamentary Markets Group (APPMG) and hold regular talks with other organisations involved in the industry. 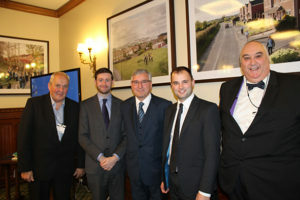 The NMTF lobbies parliament to oppose legislation we believe would be detrimental to our members and the industry. We will continue to fight to enhance the markets and events industry and preserve the livelihoods of our members. One of the ways we are doing this is through the Mission for Markets campaign, run in partnership with the National Association of British Market Authorities (NABMA). In addition, the NMTF also negotiates at the local level with market operators and provides advice and guidance to members on any small business matter. As a member of the Genesis Initiative, NMTF is active in Europe, making positive attempts to influence EU legislation before it becomes law. Are you a member of the NMTF? Contact us and tell us what you think should local and national government can do to support businesses like yours! Pictured standing (left to right): Hilary Paxman (DCLG), Michael Mack (FARMA), Joe Harrison (NMTF), Graham Wilson (NABMA), Malcolm Ball (WMC Retail Partners), Chris Royle (Valuation Office Agency), Esther Worboys (WMC Retail Partners); seated: Chris Savage (NMTF), Rachel Harban (MNTF, Markets Minister Andrew Percy MP, and Jo Taylor (DCLG). © Copyright NMTF 2019 Design and development by Contedia.